Good plant, bad weed. We pick and choose the plants we deem garden worthy, and call the rest weeds. One of the weeds you want to eliminate quickly before they become devilishly difficult is Wild sorrel. Last week a new garden tool arrived in the mail that I’d purchased on line. I decided to try it out in the garden and started weeding the wild sorrel on the edges of my garden. It is a low growing weed with small lanceolate leaves with red touches on some of the leave’s edges. 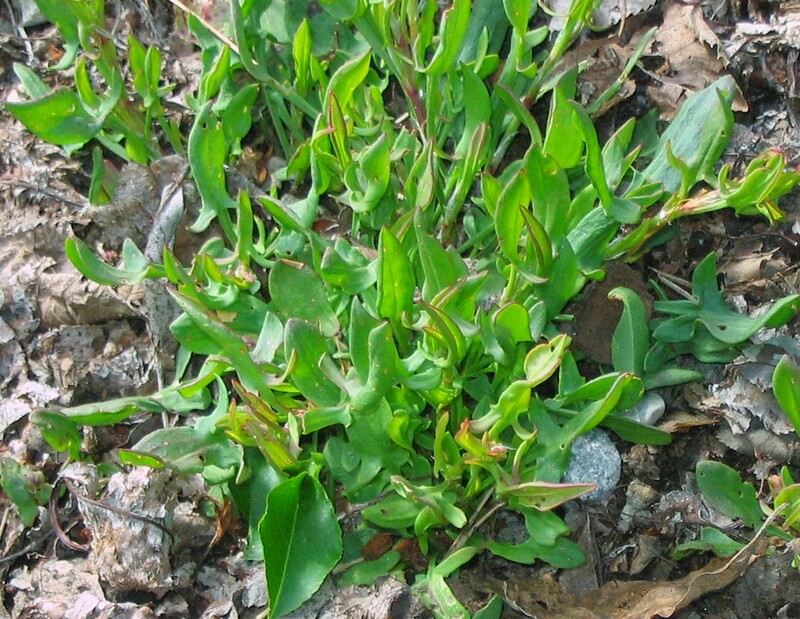 A European transplant, Wild sorrel (Rumex acetoseela) (aka Sheep sorrel, Red sorrel, Field sorrel, Sour weed, Cow sorrel, Horse sorrel, Gentlemen’s sorrel, or Toad sorrel) is a cruising demon. It prefers soils like mine that are poor often sour, or acidic, types of soil. These very prolific plants produce red stems that rise above the basal growth of leaves to produce reddish-green flowers that turn into tiny capsules holding hundreds of seeds. The real menace is the roots which travel great distances from the plant. I’ve carefully followed three foot long yellow roots from plants no larger than three inches in diameter. The roots not only spread out, but down. I’ll have to keep vigil, too, because each broken root will produce a new plant. However, Roundup wasn’t very effective, so I decided to dig them out. According to Edwin Rollin Spencer in his book All About Weeds, Rumex is Latin for sorrel, and the acetosella means ‘the little vinegar plant.’ For centuries sour plants have generically been called sorrel (83). I think they have a lemony flavor. Yes, they are edible, and have been used in culinary arts since the Iron Age, the most famous use is in sorrel soup. You can find many recipes on line. The leaves are full of vitamin C, but need to be blanched to get rid of the oxalic acid. If you make the soup and fall in love with the taste, there is a another species, Rumex scutatus, that is better behaved garden plant. It’s leaves are larger and used like spinach. Spencer, Edwin Rollin. All About Weeds. 1974. New York. Dover Publications.